Medieval Krakow had round it two-mile-long walls with 39 towers and 8 gates. Their construction began in the late 13th century. The city walls proper were as high as ten meters and 2.5-meter thick. Alongside them additional lower walls ran. And an eight-meter-deep and 22-meter-wide moat protected both. 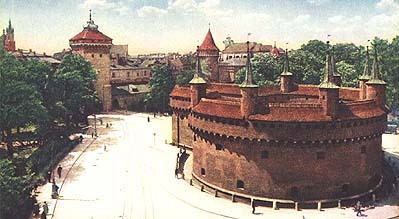 In the first decades of the 19th century Krakow's imposing if outdated fortifications were largely pulled down. Fortunately, the main city gate called Brama Florianska survived together with three adjacent towers, the walls between them, the 16th-century city arsenal, and a giant barbican in front of them all. The Brama Florianska gate, built about 1300 as a rectangular Gothic tower of wild stone, is 33.5 m tall. In the Middle Ages the Krakow furriers defended it. Its present baroque roof dates from 1694 and a big 16th-century bas-relief of St. Florian adorns the south wall. The famed 19th-century painter Jan Matejko designed a stone eagle on the other side of the gate tower. At the Brama Florianska gate Krakow's Royal Road begins. Here entered kings and princes, foreign envoys and guests of distinction, coronation processions and other parades, to move up the Florianska Street to the central Grand Square (Rynek Glowny), and further down the Grodzka Street to the Wawel Royal Castle. From April through October visitors may tour the Brama Florianska gate tower and the adjacent medieval fortifications every day from 10:30 a.m. to 6 p.m. Entrance for the sightseers is situated in the Baszta Pasamonikow tower at the eastern end of Pijarska street at Szpitalna street. The 180-meter tour runs through a parapet walk via the neo-Gothic upstairs chapel of the Brama Florianska gate to the Brama Stolarska tower and it also includes the barbican (Barbakan). A normal ticket is eight zlotys. 15th-century impressive Grand College of the Krakow university where Copernicus once studied. The most beautiful of Europe's ancient streets, arguably. Poland's prime tourist attraction and a must-see in Central Europe boasts numerous world-class monuments, charming vistas, delightful atmosphere, and the best restaurants.. Copyright © 2000-2018 by MAREK STRZALA. All rights reserved.